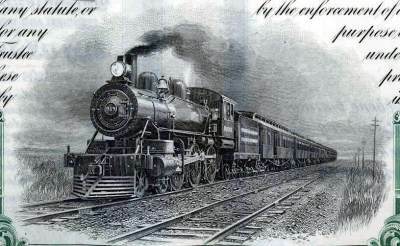 Beautifully engraved certificate from the Winston-Salem Southbound Railway issued no later than 1927. 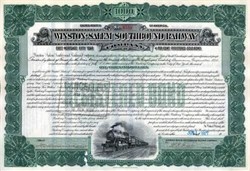 This historic document was printed by the American Banknote Company and has an ornate border around it with a vignette of a train. This item is hand signed by the Company’s President and Secretary and is over 78 years old. The Winston-Salem Southbound Railway Co. operates from Winston-Salem through Lexington and Albemarle to Wadesboro, serving industries in the central Piedmont counties of Forsyth, Davidson, Stanly, and Anson. Incorporated in 1905, the company began service in 1910. While the company is independently operated, all of its stock is owned jointly by CSX and Norfolk Southern. Commodities carried by the railroad are grain, sand, gravel, stone, forest products, paper products, coal, coke, cement, clay fertilizer, aluminum, chemicals, iron, and steel. Principal shippers are: Corn Products Co. of Winston-Salem – manufacturer of corn syrup and related products; and Owens Brockway Glass Co. of Eller – manufacturer of glass products. The Winston-Salem Southbound connects with four railroads: Norfolk Southern; CSX; High Point, Thomasville & Denton; and Aberdeen, Carolina & Western.